I heard recently that Google has set up an Endangered Language Project, which I find interesting. There’s even an interesting map showing dots of where these languages are. I tried my bit by learning Scottish Gaelic (my great grandmother spoke it), but things being what they were my priorities have changed somewhat – Spanish, French and Catalan have moved up the list of languages to learn. Although I still dip into my Scottish Gaelic book, I just can’t concentrate so much on it, and I don’t have the context to practice it. It’s a reality that languages die out, or they change beyond recognition. And even if we enter a lingual “bottle-neck” (like Latin a couple of thousand years ago, or English now) where local languages are soon pushed over by a more popular language sooner or later down the line that popular one will soon find itself branching. Languages just aren’t stable things, otherwise all the modern speakers of Romance languages would be still be fluent in Latin. I am sitting here in just a pair of shorts and flip-flops, and making extensive use of my abanico or fan. It’s hot! And that’s just inside, in the shade. I’m glad to live in a mountain forest. When I do go out it’s time to do shadow-hopping; it’s a local skill, only going out into the sun when necessary. You can tell the foreigners: they want as much sun as possible (not surprising, considering they’re here for sun from countries with much less). The heat has affected the culture in very interesting ways. It’s getting to lunch time, so most of the shops will be shut for a few hours, and people will have their siesta. They’ll reopen later, and it’s not so strange to go shopping about 8pm. In the evenings, when the sun has disappeared, it’s refreshing to sit outside your front porch and just sit there a la fresca, possibly until well into the night. Children can sometimes still be seen outside quite late (hey, it’s 4am, how about another round of hide-and-seek?). Recently I wrote about the primal roots of language, this actually came from a line of thought about creating an “ecolang” (or ecological language). I have several ideas like doing something onomatopoeic i.e. the words resemble what they represent (such as “cuckoo” in English represents the bird’s sound). Another is a tense based on the seasons; it gets a bit complicated, but there are four tenses, one for each traditional season; whatever happens to be the present season is the present tense. At present it is spring (just), and so that is the present tense. Winter is past, and summer is future (not strictly for describing the previous and next seasons), whereas autumn represents a combined distant-past/far-future tense (representing a sort of circular nature of time). The tense changes for each season. Verbs can be marked for their arguments to show interrelatedness between things. “I love you”: I and you are the arguments, and the verb can be mark for first and second person (in Spanish verbs are marked for the subject of a verb phrase – in this case it is “I” – we only need to extend the idea to other arguments, like direct objects). The idea I’ve been thinking of is that the language shows interdependence in its grammar, and also a correspondence with the environment it finds itself in, rather than being abstract ideas. But going back to the first line, the important part of an “ecolang” is not how “ecological” its grammar, phonology, etc. are but how connected to the body’s expression it is. The body is our “ecological anchor” in the world, something fancy “ecological” grammar might not take into account. Doing the Novel Writing course with the London School of Journalism has been very interesting for me; I’m going through a step by step process, learning some of the technical bits of writing stories (the imagination part, the story and its background, I have no need to learn about, lol), how to use the words, how to “use” the characters and situations to explain bits about the world and the story. It brings its own challenges too. I like dialogue, and I like action, to read. Description of scenery and people I don’t like because part of the magic of reading, for me, is that I can fill in the blanks*. Often a book will describe something but my imagination has already decided what something looks like, and I just can’t shake it off and replace it with something I’m reading. What I’d skip in some books I’m trying not to put too much emphasis in my own writing. Each writer has their own style. *description of a world in a sort of historical-cultural overview is a different matter. 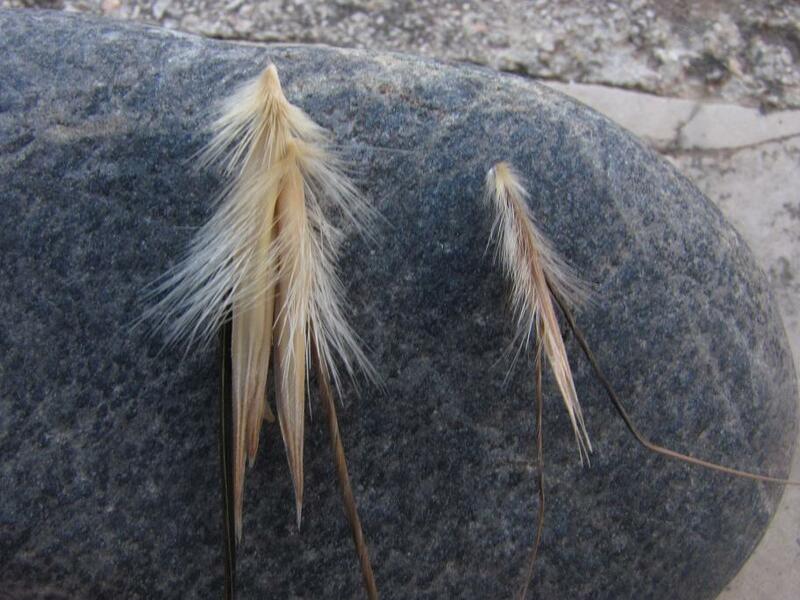 We have two types of oat growing here: the cultivated variety and the wild variety (Avena sativa and probably Avena fatua). The cultivated oat is a bit of an accident really: we sometimes feed our goats and chicken with oat which then get transfered to the compost, and the compost is used for our veg patch, where we find oat begins to grow! Last month I entered into an artistic competition on OBOD’s website and won in the prose category. If you click on this link my story’s the first one (it was a pretty close run thing); it was originally written for Realms Beyond the Sea. I continuing the trend and have entered into a writing competition with Catalonia Today, a magazine that I am subscribed to, an English magazine for those living in Catalonia. I’m really looking forward to the results and would love to share my own story here, but there are some restrictions on publishing before the time. I promise you, once the competition is over and done with then I’ll happily share what I wrote here! I started to write a blog about the primal roots of language for here, but in the end it became too long and aquired a quote, so I put it on The Grove of Quotes here. “We do not, as children, first enter into language by consciously studying the formalities of syntax and grammar or by memorizing the dictionary definition of words, but rather by actively making sounds – by crying in pain and laughing in joy, by squealing and babbling and playfully mimicking the surrounding soundscape, gradually entering through such mimicry into specific melodies of the local language, our resonant bodies slowly coming to echo the inflections and accents common to our locale and community. Talking of crafts, it’s getting quite hot and there’s nothing like, after a hard days work, pulling out a nice cool beer from the fridge to get a bit refreshed. Maybe, instead of buying beers I can make some? Another interesting craft that’s satifying in the doing and consuming – along with home-layed eggs and home-grown vegetables, yum! There’s something good about knowing where your food comes from. I picked up a book – Home Brewing by John Parkes – and the processes it describes are complicated, and maybe I don’t have to go through buying barley, sowing it in a field just to make a few pints per year. But I can buy a few basic ingredients and do something with that. At least learn the process of fermenting before malting the barley, and see where I go from there. So many years of appreciating this drink – and the many varieties thereof – but not knowing what’s behind it, except that the ingredients tend to be barley, water and hops – and that’s not saying much. Now, ‘scuse me, there’s something in the fridge, waiting for me. Estos últimos meses han sido algo diferente por mi español. These past few months have been something different for my Spanish. No sé que es pero es como si mi cerebro tenía un salto cuantico español. I don’t know what it is but it’s as if my brain had a Spanish quantum leap. Vale, todavía cometo errores (tal vez lo de “tenía” arriba debería ser subjunctivo, no sé). Okay, I still make mistakes (I think “tenía” above should be subjunctive, but I don’t know). Pero puedo hablar con alguien que hablar el español y estar* entendido. But I can speak with anyone that speaks Spanish and be understood. I could try the same in French, but I don’t speak it much (but I understand a bit). Creo que dentro un año y medio estará hablando y escribiendo el francés como hablo el español ahora. I think that within a year and a half I’ll be speaking and writing French like I speak Spanish now. Este ha sido un experimento muy interesante para mi. This has been a very interesting experiment for me. En diez años hablará cuatro idiomas: el español, el francés, el catalán y el inglés. Ya verás. In ten years I’ll speak four languages: Spanish, French, Catalan and English. Just you wait and see. *Mika me ha dicho que esto tiene que ser “ser” y no “estar” (pero seguro que hay errores por todas partes en mi español). Lo dejo como un ejemplo de errores que puedo cometer. *Mika has told me that this should be “ser” and not “estar” (but I’m sure my Spanish is riddled with mistakes). I’ll leave it as an example of errors I can make still.